The Gluten Free Photographer: Roll Up, Roll Up For The Gluten Free News Tour! Roll Up, Roll Up For The Gluten Free News Tour! There was The Irish Times http://www.irishtimes.com who recently published what was meant to be a light hearted article about eating with those who are considered to be 'picky eaters'.
" "I’m going to make the falafels with spelt flour, so that the coeliac health nut can also partake in them." A direct quote from an The Irish Times article from Saturday 10th August written by Chef Domini Kemp. Not the first person or publisher to mistake spelt for a gluten-free grain, and almost certainly not the last. I tweeted both the paper and the chef, and Domini Kemp has politely responded. She said that her recipe could be made with GF flour, but appears to have missed the point that the above quote contains wrong advice which could potentially harm a coeliac, especially if being catered for by someone else who has read it. Coeliac Nathan Drewett tweeted me to ask why he thought so many made this mistake, and I responded that I thought producers of spelt foods have marketed it as 'different' to wheat and have failed it to call it by its full name: 'spelt wheat'. What do you think? Why does this mistake keep coming around? And why won't the Irish Times just correct the error like the Guardian newspaper would have ... ?" I shared the above on my facebook page and the overall feel was that coeliacs are depicted as faddy, health nuts who can eat spelt flour. All of which is completely inaccurate. As most familiar to the gluten free world know, spelt is not gluten free. Also, coeliac disease does not equate health nut. Just poor language in the piece and shocking that this sort of thing can still be published in an established, national publication. Sometimes it feels like (to coin an old phrase), the blind leading the blind. Coeliac Pages http://coeliacpages.ie tweeted me an image of the apology that was issued in The Irish Times. What do you think of the apology? There seemed to be a general agreement on my twitter feed and facebook that it was merely an apology to those who complained, rather than any real true clarification of why the apology was needed. Also, the online article still has not been amended to reflect the apology. The line, "I’m going to make the falafels with spelt flour, so that the coeliac health nut can also partake in them." reads the same. 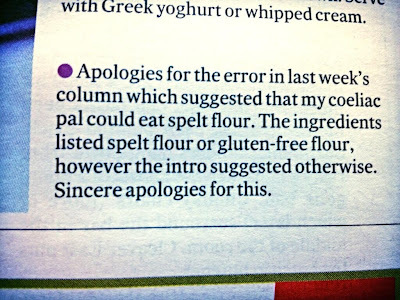 A simple edit reflecting that those with coeliac disease can not eat spelt flour would go a long way in preventing a misunderstanding and there is also a lot of potential for making those with coeliac disease/gluten intolerant very sick by someone accidentally serving them up a meal made with spelt flour. Scroll through all the feeds and you will see some interesting comments on the matter. The next thing that has been making waves in the gluten free world that I also mentioned on my facebook page was '#Djokovic's claim that his success is down to his gluten free diet. Long story short, Dr Igor Cetojevic 'diagnosed' Djokovic as gluten sensitive by holding a slice of bread near his stomach and then Djokovic felt a noticeable lessening of strength in his arm. From the Independent.ie "Next Cetojevic gave Djokovic a slice of bread. He told the bemused player not to eat it but to hold it against his stomach with his left hand while he again pushed down on his outstretched right arm. To Djokovic’s astonishment, the arm felt appreciably weaker." Personally, I am disappointed that the Independent would publish such an article, especially without clarifying that this is absolutely NOT how to begin a diagnosis of gluten intolerance or a gluten sensitivity. These sorts of articles seriously impact the gluten free world in a very negative way. There should have been some sort of footnote explaining that if you think you suffer from gluten intolerance/sensitivity to go and visit your GP and get the necessary tests done. Now you can read all about what people had to say about this on my fb page, but what I really want to make clear is this; perpetuating applied kinesiology as a means of diagnosing a gluten sensitivity is all kinds of wrong. This opens the door for exploitative behaviour towards those who are vulnerable, immunosuppressed, sick and desperate. The science behind it is at best, sketchy. Encouraging this as a means to an end confuses what being gluten free truly means and is seriously damaging to the gluten free community. If people want to try this out for themselves, fine. It's their life and it is they who have to deal with the consequences. However, I really do not like the fact that Djokovic is using a very public platform and his celebrity to allow this road to diagnosis to be encouraged. This in turn may lead to people thinking that gluten sensitivity is also pseudoscientific and that is a worrying thought. The Irish Farmers Journal http://www.farmersjournal.ie published an article today announcing that their plant in Ballytore, near Athy, is being developed to provide a supply of gluten-free oats, sourced from 400 acres of tillage farmland in the region. To quote from the article, "Glanbia have set themselves an even more stringent quality target of 10ppm." Glanbia are also commissioning a new mill in Portlaoise, Co. Laois exclusively for feed grade oats. Click on the link below to read the whole article. If you have difficulty reading it, please feel free to email me directly at glutenfreephotos[at]gmail.com There's also a nice explanation of coeliac disease in the feature. Good news for the gluten free community and the economy! So there you have it. That's my round-up of all my gluten free news for now. Anything you want to add or know of happening, please feel free to share.